A group of cities and counties sued to overturn the law before it went into effect. In August, U.S. District Court Judge Orlando Garcia a preliminary injunction blocking parts of the law known as SB4, Breitbart News’ Ian Mason reported. About a month later, the Fifth Circuit sided with Texas and overturned Orlando’s injunction, Breitbart Texas reported. Texas Attorney General Ken Paxton also responded positively to the announcement by the court. With one exception, SB 4’s provisions do not, on their face, violate the Constitution. For the following reasons, we uphold the statute in its entirety except for the application of the “endorsement” prohibition, Tex. Gov’t Code § 752.053(a)(1), to elected officials. The state’s attorney general’s legal team presented oral arguments on November 7, Paxton stated. Governor Abbott made passing a bill to stop sanctuary cities in the Lone Star State during his State of the State Address. “This is the session we will ban sanctuary cities,” to the joint session of the Texas Legislature. Specifically, the governor referred to State Senator Charles Perry (R-Lubbock) who filed SB4, calling for sanctions against sanctuary jurisdictions within the Lone Star State. Travis County Sheriff Sally Hernandez became the poster-child for passing the bill after she quickly reversed her department’s policies of cooperating with federal immigration officials shortly after being sworn in in January 2017. Words just can’t express how disappointed I am with this ruling. We are reviewing the Court’s opinion to determine any additional steps that need to be taken. We will continue to follow the law as provided to us by the courts in this matter and we will rise to the challenge of keeping Travis County safe, although our ability to overcome fear and foster cooperation within the immigrant community is a greater challenge now. U.S. Immigration and Customs Enforcement officials reported in March 2017 that Travis County led the nation in the release of criminal aliens in its weekly Declined Detainer Outcome Report. Sheriff “Sanctuary Sally” Hernandez’s (a nickname given to her by her opponent during the 2016 sheriff’s race) office 70 of the 206 criminal aliens released by sanctuary jurisdictions, Breitbart Texas reported. In January 2018, the Texas Office of the Attorney General confirmed to Breitbart Texas that it was investigating San Antonio Police Chief William McManus for possible violations of the SB4 law. 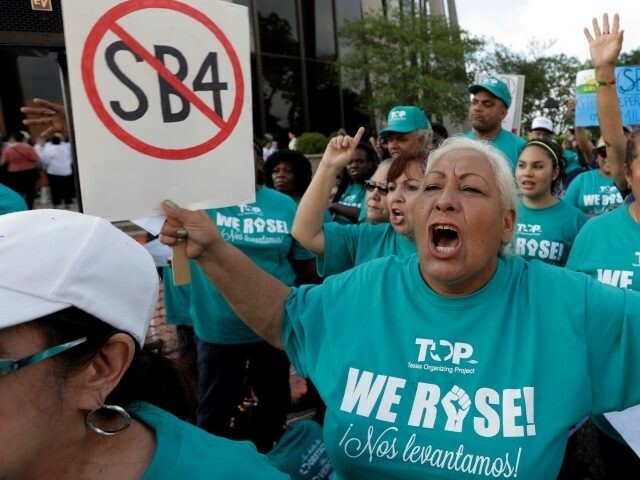 The investigation could lead to a criminal prosecution under the SB4 anti-sanctuary city law passed in the 2017 legislative session. “Several citizens have filed complaints with the Texas Attorney General’s Office regarding an incident on December 23 involving the release of numerous suspected illegal aliens,” Assistant Texas Attorney General Cleve W. Doty wrote in a letter to San Antonio officials. The case is City of El Cenizo v. Texas, No. 17-50762 in the U.S. Court of Appeals for the Fifth Circuit.